Practically perfect wouldn't you say! The pom-pom looking ones are not to my liking! No sirree! I like my coneflowers simple. Recurved or upright petals are fine with me and those purples are perfection! But....I'll come clean! The newer colors are starting to look good! Really good! 'Mac n Cheese' and 'Tomato Soup' (from Flickr) Mouth watering! In the meantime, here are my newest nativars/cultivars and hybridized coneflowers. 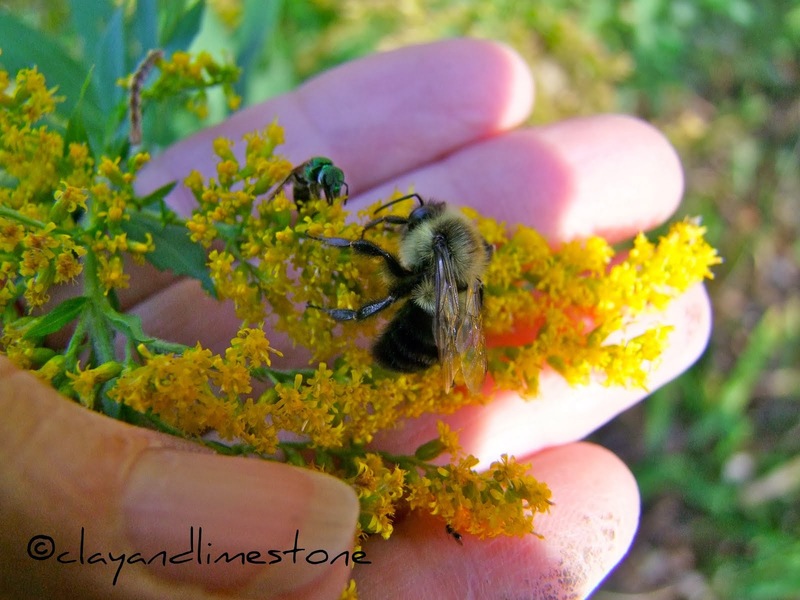 Is there anything more gratifying then seeing a bee covered in pollen? with light gold petals and a classic central cone. Those newer colors have called to me! This flower has the sturdiest branches and stands up straight and tall! I just brought her home for fall planting.... I hope she likes it here! 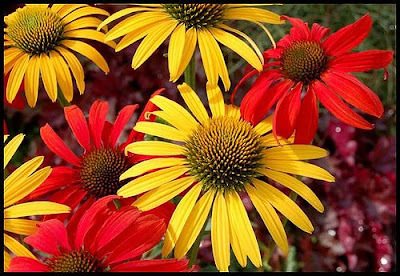 So tell me~~Have you invited the newer coneflowers into your garden? The prices on the designer echinaceas these days ($15 - $20 -- oh, please!) stop me. Two years ago, I was able to get my 'Sundown' and 'Harvest Moon' at wholesale prices by buying a flat of each. HM didn't like my garden, but the 'Sundown' are still going. The SD don't rebloom well, but my ONE remaining HM is reblooming. I like my 'Ruby Star' and 'Prairie Splendor' and have recently started 'White Swan' from seeds and a few pots on sale. Dear Gail....yes I did buy the fancy ones last year and lost them all. They do not like my wet winter soil. I've lost at least three orange-flowered coneflowers over the last few years and had sworn off buying any more of them or their yellow brethren. Then I saw Big Sky Sunrise at a local nursery and mamma mia, there I went again! Thus far it's not doing too badly. I bumped it from a one gallon container to a two gallon. I think I'll cut off the blooms when I get home per Dee's suggestion.If it will save the plant, I can sacrifice a few blooms now for the sake of future beauty! I tried several of the newer cultivars when they first came out and none survived our winters. There is a lot of discussion about these new coneflowers and most of it isn't good. I think I'll pass tho they certainly are pretty. Is that nicotiana sylvestris in your last photo? I was wondering how tall they get and if they have to be staked. Love the picture with the bee. It does my soul good to see it. And no, their really is nothing to compare to a bee covered in pollen....except maybe a spoon covered with honey. my garden is sadly lacking coneflowers. It a pity too, because there are so many nice ones to choose from! Your are beautiful and I love the nicotiana as well. It's so tall! That tomato soup echinacea is stealing my heart! If I saw it some place, I'd have to buy it. I've added an orange (sunset) and green wizard to my yard but that's as far as I've strayed from the tried and true. Your photos are beautiful. I'm sure all your new additions will love it at C&L. I'm going to try to post a video tomorrow which shows the bees and my Coneflowers, including a new one, 'Emily Saul' (After Midnight). It's most remarkable. I can easily live without the pompon flowers too. I'm still waiting for the echinaceas to load, don't know what's wrong. I'm seeing some pics from July 1, toward the end of the page. I just have the regular old kinds of coneflowers. Checkerspots in my garden like to pose on Lantana. Gail -- Love the Mac-n-cheese and the Tomato soup! How bright and fun they are. I didn't even know they came in those colors. I am trying "Green Envy" for the first time this year, but no blooms yet. I just bought one tiny expensive mail-order plant and have been babying it with my fingers crossed. Well, I'm the answer to your title question. I haven't liked coneflowers much in the past. My dad grew some when I was growing up and the leaves were so coarse and hairy that they turned me off. But the flowers of Harvest Moon are really lovely. And the new 'Pink Poodle' has snagged my attention - like a zinnia that doesn't need to be grown from seed each year. We'll see. I've had to eat my words about past plant dislikes before, maybe I'll do so again! It's not so unpleasant if I get a great new plant for my garden out of the deal. Coneflowers are my favorite, and I like them all! I've added several varieties this year, and I sure hope they live through the winter. I still love the traditional purple ones, but the pom-pom styles are favorites too, especially my pink Double Delight and Coconut Lime. I just added White Swan and Big Sky Sunset recently, so we'll see how the flowers turn out. Love all coneflowers, Gail. The orange ones won't survive in Chicago. This year I've added 'pixie', a dwarf, to my garden. Gail, ohhh,ahhh! Coneflowers are loved dearly here. they are such magnets for bees and butterflies, who wouldn't love them. Your native is especially pretty and something to be proud of. Like you, in the last year or so, I have started to want other colors. I did get Sundown or Sunset-I never can remember which it is. :) And I am loving it and saving every seed. I did fall for the pink double which has a pom pom look to it, but it is sooo pretty. (saving those seed too! )Not fond of the greens though. Can't wait to see your new colors all planted together! What a nice collection of coneflowers you have Gail. I don't have any of the fancy varieties now. I did have a green one that didn't do well. A white one that didn't do well so I have stuck with the old favorites. I love the new colors though. When I see a photo of them I always want to try some. 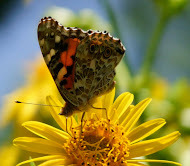 Love your butterfly pictures. I really prefer the wild ones. They seem to be doing well here after a tenuous start. I love coneflowers but haven't really jumped on the new cultivar badnwagon, either. I do have one plant that has both white and purple blooms. I love the tomato soup one and some of the oranges spoke to me, but I always wait a while to be sure they really work in my zone (a few of the new coreopses didn't). I bet you know what I think about those newer cultivars.... But harvest moon came back for me this year, as did something else, wine or something? I don't remember. I think Dee's sugestions about cutting back the light cultivars sounds like a plan I might try to save some of these overly priced hybrids. I have some pom poms also and I do like them but the Big Sky varieties are very beautifully colored. Haven't seen 'Tomato Soup' yet but that should be on the list. Love that color. 'tomato soup' and 'mac'n'cheese' do look pretty hard to resist. a nice change from that pink/purple/fuchsia color that seems to be everywhere, I think. I've got a pale yellow one at school which is quite cool. a student was truly mesmerized by one the other day which I had cut off and brought into my classroom. It was a tactile thing... the center of the flower. For the most part I do prefer my coneflowers straight up, but Harvest Moon is lovely. I really don't have many of the newer ones but the Mac and Cheese with Tomato Soup sounds good! Save your seed heads and we'll trade seeds this fall! The Big Sky series has been a pleasant addition and I scoop some up whenever I come across them. But my favorite will always remain the old standard plain purple. I like my flowers to be like me - simple. Oh yes, I've invited many new coneflowers in...Tomato Soup has just started to bloom but Mac N Cheese hasn't yet. Some of my others have started to bloom, but I have plenty to look forward to. and of course, Hot Papaya isn't around here yet, (the one I want the mostest of all...) but if it's as good as Coconut Lime, it will do well when it finally is available in Nova Scotia. I LOVE the new coneflowers as well as the natives. I added 'Coconut Lime' and 'Tomato Soup' this year, to my ever-growing collection. I think I have all the Big Sky series ones and a few others. I love my E. tennesseensis! It's a no-fuss coneflower in my garden - it always looks good. Gail, I see a little photo on your sidebar of a Tennessee Coneflower with upcurving petals. Is that they way it always looks? I look forward to having my little plants mature! I was feeling confused about the difference between the different kinds of Echinaceas, so I did some looking around. It was hard to find what I was looking for. I found a good article on on botanical names while trying to find the difference between species, cultivars and hybrids in Dave's Garden. I had a native purple coneflower from a neighbor lady when we first moved in. After a number of years, it didn't survive a winter. I bought a white swan that is still white in the original spot I planted it in around 10 years ago, and the part of it I dug out to put in my new bed last year now has purple flowers. Last year I planted a Harvest Moon, and a Kim's Knee High. I like them both, and they are doing well this year. Oh, I also planted several Magnus ones in other areas. They are not as new. I read in the mentioned article that they do not grow true from seed. After hearing there were problems with some of the newer varieties, I tried to steer clear of them. I found some Ruby Stars and Prairie Splendor this year that I assumed were not new, but found out I was wrong. One thing I noticed from doing my looking is that some of the names have the trademark symbols on them. I do have a bit of a problem with plants that it is illegal to propagate. I do have a couple of them. I have put plants back before that have that on them. Part of being a gardener for me is dividing and sharing plants. I've carried on a bit! I like your assortment there, Gail. The HGTV article talked about using both natives and non natives together like we do.